CPR Educators is a leading provider of CPR classes, first aid, and AED training for people in Wake Forest. Our instructors include nurses, EMTs, physicians, and other emergency service providers in addition to having extensive experience in CPR instruction. They are dedicated to not only making sure our students pass the certification skills assessment, they make sure to provide the instruction and training for real-world use, too. Why Take CPR Classes in Wake Forest? 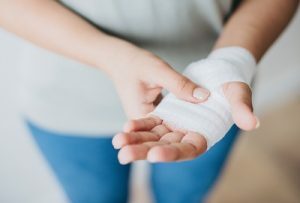 While most of us don’t think we’ll ever need to perform CPR or first aid, beyond maybe patching up a minor injury, the simple fact is that these skills save lives. In the event of an emergency, knowing how to perform CPR until first responders arrive can be the literal difference between life and death. CPR Educators’ classes empower our students to step up and take action with knowledge and confidence when there is an emergency. Whether it is your relative, a co-worker, or even a stranger on the street, you will be able to administer lifesaving CPR that can reduce the risk of brain damage or even death, while first aid skills mitigate shock, blood loss, and other severe complications. At our American Heart Association Authorized Training Center in North Raleigh, we teach several emergency training classes, including a pediatric CPR class. We seek to provide small classes that allow our instructors to make the experience not only informative but also fun, engaging, and interesting. Our goal is to go beyond the skills assessment and make sure every student not just passes the test but can apply skills in a real-world situation. This course instructs Wake Forest students to respond to illness and injuries in infants and children and is designed for parents, babysitters, and child care workers. This certification meets all the requirements set by the Department of Health and Human Services for child care workers. The Basic Life Support (BLS) CPR class teaches healthcare personnel, including dental professionals, firefighters, and EMTs, how to administer CPR and cardiovascular life support skills both in a facility setting and in a pre-hospital location. For students who prefer a self-paced program, this course blends online instruction to learn the skills, with a classroom setting for hands-on training and the skills assessment portion of certification. This class meets the requirements for anyone who needs training in compliance with OSHA Standard 1910.1030 and teaches students how to act and react in the event of exposure to bloodborne pathogens at work. OSHA 29 CFR 1910.157 requires certain industries to provide training in how to safely and effectively use a fire extinguisher. We make sure students are familiar with using an extinguisher to safely put out fires. We offer several CPR classes, first aid training courses, and more at our convenient North Raleigh location that’s only a short drive from Wake Forest. CPR Educators schedules multiple classes each month at varying times, making it convenient to register for the class that works with your needs. We offer on-site CPR classes along with our other emergency training courses for businesses and organizations who want to provide a convenient location for their employees to get certified. Our instructors will come to your business to provide customized instruction that aligns with your industry, such as child care or dentistry. CPR Educators works with all types of organizations, from small businesses to large, Fortune 500 corporations. We are proud to teach the skills that save lives! To learn more about scheduling a class, on-site instruction, or just to ask a question, reach out to us today at (919) 639-4848, send us an email, or fill out our contact form!